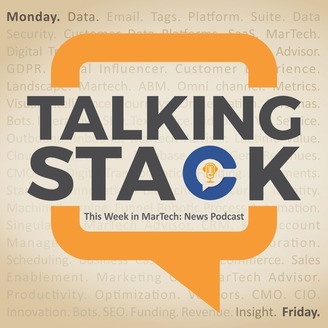 As Marketers – B2B, B2C, Enterprise, SMB – we can’t help being somewhat overwhelmed by just how much is going on in MarTech! 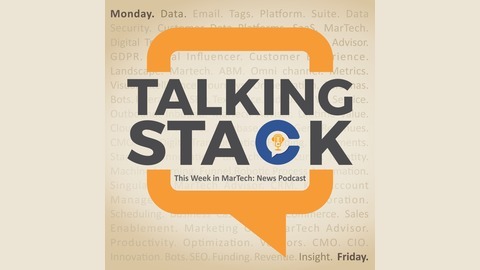 Make sense of MarTech & Digital Marketing headlines with the Talking Stack experts - David Raab, Anand Thaker & handpicked Guests - and host Chitra Iyer. We promise practical connections between the Big News & your life as a marketer. It’s 20 minutes of honest, educative, thought-provoking - and often entertaining - discussion about all the latest in Digital, Omni-channel, Privacy, Customer Experience, Customer Data Management, Content Experiences, Social Media Marketing, B2B Marketing, Search, Mobile Marketing; AdTech, Performance Marketing, SalesTech, and more! This week, David, Anand and I are joined by Nancy Nardin, creator of the Nancy Nardin Salestech Landscape, to talk about all things Salestech. How to buy salestech, why to buy it, who should buy it and how to optimize the outcomes from salestech investments. Here are the highlights: The evolution of Salestech and state of the landscape: it’s a scattered approach but it should be strategic. - Salestech is more than CRM - Why we aren’t investing as much or as well in salestech as we should be - Who is in charge of salestech buying? - Why is sales tech lagging martech so much? What are the traits of sales organizations that are leveraging tech really well? - They have made a commitment to tech as a strategic imperative - Start with capability gaps- not technology - How do we build a roadmap for the right technology rollouts? - The Hierarchy of Sales Need – the highest level (who we are selling to and why) versus the bottom of the hierarchy: driving leads into the funnel - Managing sales capacity optimally by prioritizing where salespeople spend their time and investing in the tech to enable that Who is on the buying committee for sales tech and what are their dynamics? - Marketing ops - Sales ops - Sales enablement - Sales leadership Should we be talking about the Revenue Stack instead of the sales or marketing tech stack? Are sales and marketing too closely inter-woven to separate the stacks so cleanly? Understanding the different priorities of sales and marketing - how can marketing help sales be more efficient? Is marketing thinking empathetically enough about what sales really needs? The notion of quota, moving from activity-based measurement to outcome-based sales activities, and the 3 trends impacting tech-enabled sales teams: - The maturity of Inside Sales - Sales enablement as a role - The potential of AI to change the game for reps The 5 basics sales priorities and finding the tech and tools to help enable that - Are sales people focusing on the right things? - Do they have the right tools to get prospects to engage? - Do they know how to leverage content to communicate value? - Are they able to close in a timely way? - Do they have the ability to sell again? What is the basic minimum salestech stack requirement for a high growth company? - CRM - Online meetings - Lead list building/ Access to contact information - eSignatures But then Nancy questions if CRMs are really designed for high-velocity sales organizations How can sales people be more transparent about their products and build trust with buyers? - Nancy says ‘listen and ask layered questions’ - David says ‘don’t focus on features alone but try to address their more operational questions honestly in demos. Help the customer ask the right questions’ - Anand says ‘understanding the context and career stage of the prospect they are talking to, since investing in tech is an important milestone in their career’ is an underrated sales skill - a LOL moment about Sales ‘biggest weaknesses’! Cutting the FAT (fetching/ assessing/ tasks) in sales: only 35% of a sales rep time is spent talking to customers. Why? And where do they spend the rest of their 65% of their time? How can salestech help move that 35% to 50% and what would our revenues look like if that happened? Biggest changes in the salestech landscape - the biggest chunks of tools on the landscape are from just 2 major categories: Who to sell to, and How to keep them engaged. All the rest of 40+ are squeezed into the second half of the landscape. At the top of the funnel is marketing, bottom is management. A lot has to happen to close a deal- how do we get the tools that helps the rep to succeed in the middle of the funnel? Nancy suggests the need for a framework. News of the week: Why did McDonalds buy Dynamic Yield? McDonalds’ biggest acquisition in 20 years: Buys personalization and decision logic technology company Dynamic Yield.